Sweet coat your lips and speak words with honey and bees to your beloved! The word "honey" comes from Hebrew and means "enchant". 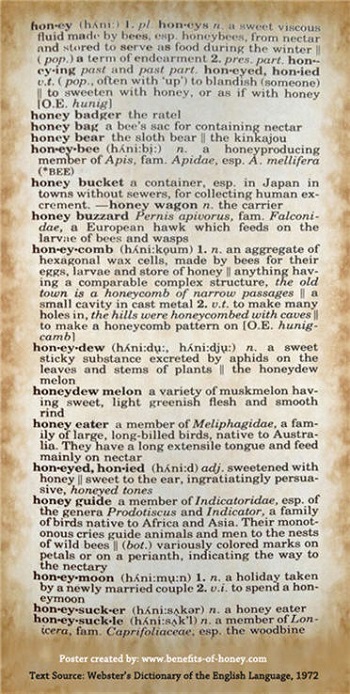 Along with variations like 'honey pie', "honey" has become a term of endearment for loved ones. A symbol of all sweetness, the word 'honey" has gone beyond its association with its benefits as a food and has crept deep into many cultures and languages. Think about words with bees and honey and notice that whenever they are mentioned, it usually has to do with something good and positive. 2. "As busy as a bee"
3. "He is attracted to the woman as bees to honeypot"
4. "The three most difficult to understand; the mind of a woman, the labor of the bees and the ebb and flow of the tide". 5. "The diligence of the hive produces the wealth of honey"
6. "One bee is better than a handful of flies"
7. "Honeymoon" signifying a sweet period after marriage. The use of honey as an aphrodisiac today can be traced back to many cultures and traditions whereby the sweet sticky liquid is popularly shared between lovers as a sensual food. It is often associated with blissful times, romance, union in marriages, and honeymoon. More in: Honey is an Aphrodisiac. 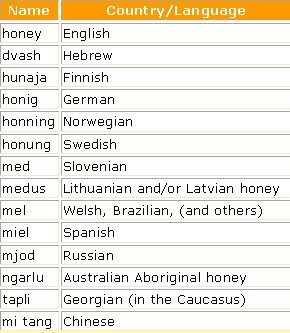 How about learning the word "honey" in a few languages? End of Words with Honey and Bees. Back to Quick Honey Facts.